In June 2015, there was an eczema public forum held at the National Skin Centre Singapore and one of the talks was “Making the Right Choices for Your Skincare – Expert tips on Selection of the Right Moisturizer and Skincare Products” by A/P Professor Giam Yoke Chin. There was a segment of her talk where she shared about the evolution of moisturizer and what key ingredients are in them. Seeing the high level of interest that the audience had in moisturizers, I’m inspired to write a post on the common moisturizers found in pharmacy (in Singapore/Asia as some brands are marketed under different brand names in the US/UK). So this 2-post series is mix of what I’ve learnt in Prof Giam’s talk and my own compilation of moisturizer’s ingredients; let me know (in the comments) what moisturiser has worked for you/ your child with eczema! 1. Labeling such as the term ‘natural‘, ‘hypoallergenic‘, ‘organic‘ (if no certification is mentioned), ‘dermatologist-tested’ (one dermatologist is also ‘dermatologist-tested’), ‘for sensitive skin’, ‘for baby skin’ are unregulated and up to the product company to define. 3. The first ingredient has the highest content – typically, if it’s water, it means it’s lotion form. Having water in the ingredients will mean requiring preservatives to keep it from spoiling. A lotion/cream can deliver the ingredients to the skin faster as it’s easier to be absorbed vs ointment that’s longer lasting. 7. Moisturizers should hydrate your skin. if you’re not able to apply it frequently, you may want to opt for ointment (for longer lasting effect). If you can apply frequently (and depending on the weather/season), a lotion/cream may feel better on hot, humid days. Look out for ingredients such as cross-linked hyaluronic acid, sodium salt of pyrrolidone carboxylic acid, panthenol, salicornia extract, glycerin, amino acids and urea that can hydrate your skin. These are typically called natural moisturizing factors, referring to moisturizers with humectant property that attract water from environment to the skin. 8. 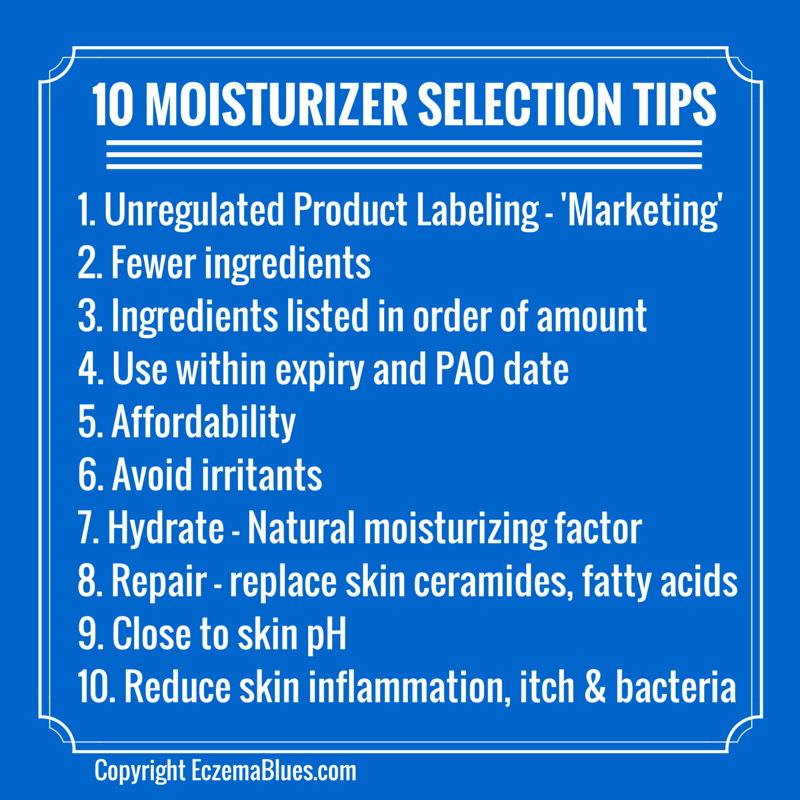 If you can afford, use moisturizer that has the ability to repair the skin barrier. These ingredients that help restore the skin barrier, especially in increasing the ceramides, fatty acids and cholesterol in skin which is deficient for those with eczema. 9. Select products that are close to the skin pH which is slightly acidic from 4.6 to 5.6. The more alkaline a product, the more drying it is for the skin. It has been studied that the skin pH can affect enzyme balance on our skin and the more alkaline a product, the less enzymes are produced that are able to increase our skin’s ceramides and lipids. Reduced ceramides lead to our skin not being able to protect against skin inflammation and bacteria. 10. There are creams that have ingredients to reduce itch, inflammation and bacteria, for instance, antioxidants, oatmeal, acetyl-hexapeptide-15 and honey.